Wallet/Money/CreditCards(You can get cash in KTM with a Visa or MC card. Bring $500.00 in extra cash – some small bills for tips. Of course, there is great shopping in Kathmandu and we have allowed plenty of time for shopping and site-seeing. Kathmandu is a sub-tropical city at about 4,000’ in elevation. Day time temperatures will be 70-80 degrees in the daytime and 50-60 degrees at night. Note: one bag of luggage can be left at the hotel in Kathmandu, for clean city clothes when we return. Airline tickets, extra money, credit cards, etc can be left in a lock box at the hotel. You should always keep your passport on you. Our journey through the mountains will take us from a starting altitude ranging from 9,000’ to over 18,000’. We will experience a huge climatic change as we journey along. At the beginning we will be in shorts and t-shirts for daytime. By the time we reach 18,000’ it could be snowing with day time temperatures in the 30-40 degree range. Nights can get as low as 10 degrees. Pants – Comfortable hiking pants preferably made of Schoeller fabric. Gortex should fit over your pants and your poly-pro bottoms underneath. Down Parka – Should fit over your pile jacket. Light weight is OK. Your GTX shell needs to fit over this. Pack – A good quality large, 3,000 cu. in. day pack is required. This can be your carry on for the airplane. It should accommodate all of your camera equipment and some extra clothes etc. Foam Pad –Bring a short thermarest pad to go over the pad that is provided . Ski Goggles – Hopefully you won’t need these. They should fit over your glacier glasses. Snacks – clif bars, m&m’s, nuts, gorp, beef jerky, hard candy, gum etc. Pocket Knife – Put this in your checked luggage! Camera Gear – tripod, and telephoto lens, Electronic cameras work great, bring extra batteries and lots of memory. Personal First Aid Kit- Our expedition will have a large well equipped first aid kit. We also carry a Gamov Bag and our guides have extensive knowledge about third world illnesses and altitude problems. However, you should have a small personal kit with Band-Aids, tape, over the counter pain killers, Pepto Bismol tablets, Mole Skin or Mole Foam, Tums, Eye Drops and Cough Drops, second skin, 4X4” gauze. If you can, obtain a prescription of Cipro and Bactrin to bring along for your personal use. What to carry all of this in?! For traveling we recommend one or two of the Wild Things Mule Bags. The Mule Bags can be rented from us for $35. You are allowed 2 – 50 lb. duffels on the airplane. Paint your name and address on the outside of your bag for easy identification. Clothing and Sleeping Bags can be rented from us. If you need help finding gear or aren’t sure if what you have is adequate, just give us a call at 603-356-7013 and we will help you out. This classic 25 day trek features some of the most spectacular scenery in the world, including views of Dhalagiri and Manaslu, the 7th and 8th tallest peaks in the world. 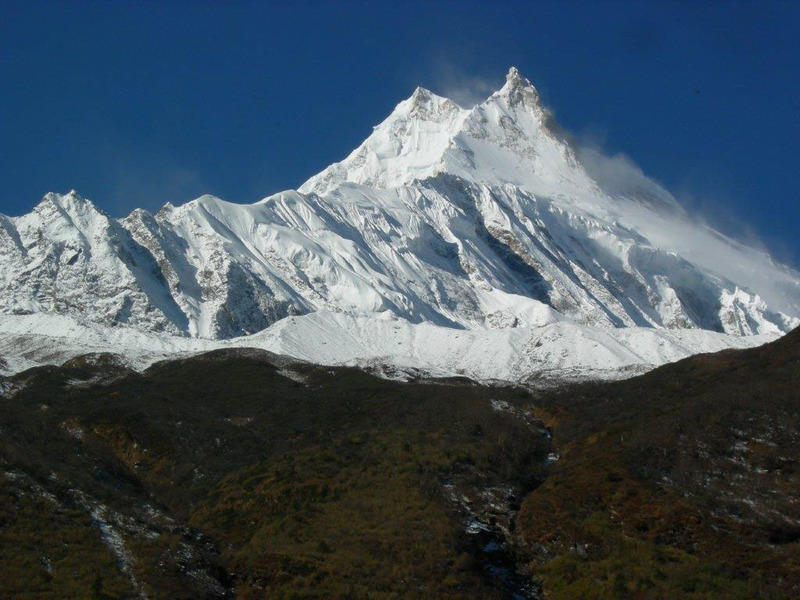 Starting in the famous town of Ghorka, we trek northeast to the base of Manaslu (8163m). We then head north crossing the Larke Pass and onto the north side of the Annapurna circuit. At the junction of the Manaslu and Annapurna trails at Dharpani, we traverse the north side of the mighty Annapurna Range. After crossing the Thorung La Pass, we descend into the Kodi Gandaki River Valley. From here a short flight brings us to Pohkara and then on to Kathmandu.